The need to customize our workspace—to enliven it and make it our own—extends well beyond colorless cubicles and dreary desks; we also feel compelled to customize our digital workspaces. Mac users have been creating custom desktop and application icons for over two decades now, often with the help of third-party utilities. It’s a trend that shows no sign of slowing, especially since we're now making use of such icons for other purposes, such as Websites, favicons, and social networking. In part one of this series, I explained how to make icons from your own photos and artwork and borrow them from existing sources in your system. In this second part of the series, I'll take a look at some freeware, shareware, and commercial utilities that can make this task even easier. Although it’s not terribly challenging to create an icon from a photo, a number of utilities are on hand to help automate the process. Image2Icns 1.2.2 (Free)—This slick utility from Shiny Frog allows you to convert any image, including Illustrator ( ) and Photoshop ( ) files, into icons. All you have to do is drag the image file onto the application window and then choose an icon format. The free version lets you export in .icns or folder format; the pro version ($12.90) also exports 16-by-16-pixel favicons and iPhone icons. Picture2icon 2.20 ($20)—Picture2icon from Binerus is very similar in concept to Image2icns, but offers additional controls. Once you drop an image onto the app, you can reposition and resize a marquee to set the crop, and if necessary, you can flip or rotate the image. The only caveat is that the utility doesn’t generate icons at 512-by-512 pixels. FolderTeint can change the color of your folders with just a few clicks. This category of utilities lets you tweak existing icons, to add a splash of color or graphical component. They’re typically quick and easy to use. iconXprit 2.1.2 ($15)—This contextual menu plug-in from Trollin lets you apply both color tint and text to any icon. The interface is a bit awkward, but it works well. This program gives you an easy way to add a bit of character to any folder. FolderTeint 1.2.1 (Free)—This simple utility from Sause Software lets you change the color of folder icons on a system-wide basis. 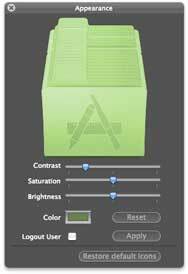 Controls let you adjust color, contrast, saturation, and brightness. You can restore the default icons with a single click. Iconic 0.5 (Free)—Iconic, from developer George Brocklehurst, is a tool that allows you to combine black and white bitmap images with a standard folder icon. The folder is then embossed with the art, perfectly matching the OS X’s home folder icons. This software is still in beta, so all the usual warnings apply. OS X’s automatic scaling of custom icons has made icon exporting utilities somewhat redundant, but they’re still necessary for creating “complete” icons with artwork specifically designed to size. Unlike the quick copy-and-paste method, an icon exporter allows you craft icons that include artwork optimized for viewing at all resolutions, from 16-by-16 to 512-by-512 pixels. IconBuilder 8.5.2 ($79)—IconFactory's IconBuilder is a Photoshop or Fireworks plug-in that lets you build an icon and export it in a wide variety of formats, including icons that are compatible with OS X, OS 9, and even Windows. The design of the icon is entirely done in the image editing program; once you’ve created versions at different sizes (32-by-32, 128-by-128, 512-by-512), you place the icons onto a template, choose the plug-in, build the icon, and export it in the desired format. IconBuilder’s countless options can be confusing, and it's relatively expensive. But it’s a very capable tool if you need its level of sophistication. Apple’s Icon Composer, hidden deep within the Xcode tools, is a simple icon building utility. If you install the Xcode tools, you'll find it in your hard drive under Developer->Applications->Utilities. Icon Composer (Free with OS X)—Icon Composer is a standalone application that, like IconBuilder, requires you to first create your icons in an image editor. Once you’ve created icons at various sizes, simply save each of them in PNG format. You can then drag these files into each of Icon Builder’s five icons wells (512-by-512, 256-by-256, 128-by-128, 32-by-32, and 16-by-16) and save. When you return to the Finder, you’ll see your finished icon. Icon Composer is straightforward and unlikely to confuse; the app’s only other notable feature is its ability to generate favicons. Unfortunately, Icon Composer can be a bit tricky to find. Slide your Leopard or Snow Leopard DVD into your Mac. Under Install OS X, you should see a folder called Optional Installs, and inside this folder you’ll find an item called Xcode.mpkg (10.6) or XcodeTools (10.5). Although you can install the full suite of developer tools, I suggest you simply extract the app you need using a shareware utility called Pacifist ($20, though you can use an unregistered copy for free). Launch Pacifist, click Open Package and then locate Xcode.mpkg or XcodeTools.mpkg (inside Leopard's Xcode Tools folder). Once the package contents have loaded, type Icon Composer into the search field and press return; the utility will then zero in on the app. Simply click Extract To... and save the application to your desktop. In this category there is really only one contender I'd recommend. Panic's CandyBar 3.2.2 ($29) expertly manages your collection of icons. To start, you simply drag and drop icons into the application. The icons are sorted into collections and listed at the left of the main window, and clicking any collection shows its contents at the bottom right. You can then change system icons (including generic documents, folders, and disks), application icons, and disk icons by dragging an icon from the bottom right into the appropriate icon well at the top right. It’s blissfully simple. All of these utilities can help you create fun new icons that you can add to your favorite desktop files and folders, or use for social networking or other decorative purposes. If you’re especially proud of your new icons, you can even opt to share them online with other users.